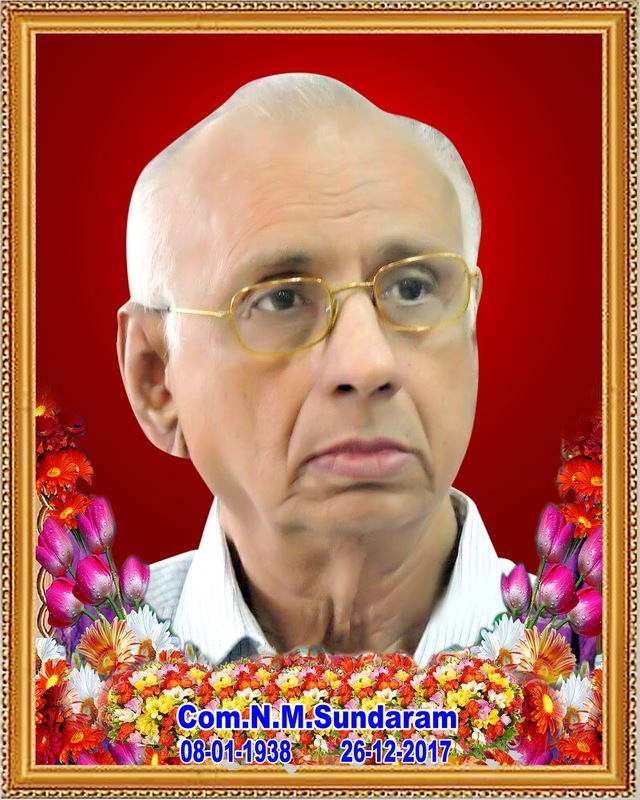 COM N M SUNDARAM, WHO REDEFINED THE ROLE OF TRADE UNION, IS NO MORE. Com N M Sundaram, the doyen of working class movement including insurance employees’ movement left this mundane world at 8.30 am on 26 December 2017. He was 80 years old. He had held organizational position spanning more than 35 years including Zonal Secretary of South Zone. 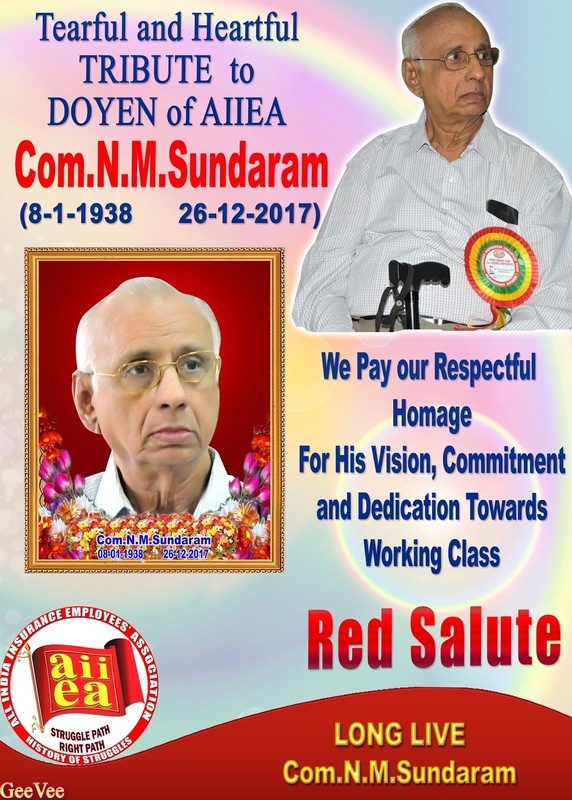 As the General Secretary and then President of All India Insurance Employees Association (AIIEA), he not only spearheaded various successful struggles to improve the service conditions of Indian insurance employees but inspired members to work for vulnerable sections of society. His contribution to Pension battle is praiseworthy. He redefined the role of trade union by not just confining it to wage hike as many think but inspiring employees to work hard in office for growth, prosperity of own industry and fight on street for betterment of society. His innovative idea of “people for India forum” created platform that helped insurance employees to discuss, deliberate problems of masses with other eminent persons of society. He was a towering personality. He was highly talented, eloquent speaker and powerful writer. He had written many articles in insurance worker also some books. He had delivered many speeches and had participated in debate, discussion with many eminent persons of society. 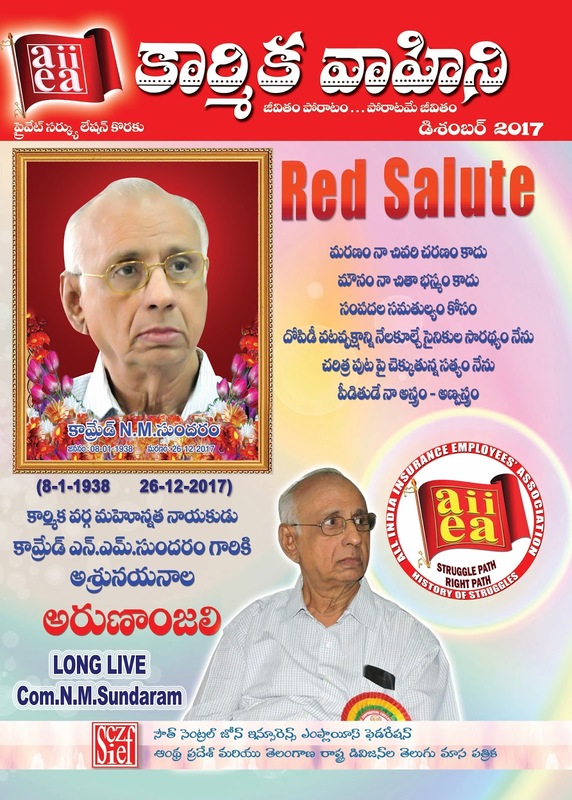 He was also editor of “Insurance worker” the monthly journal of AIIEA, the quality of article published in it is equivalent with any important journal/magazine of India. His editorial and column titled “Let us play politics” was very thought provoking and highly didactic. Com. NM Sundaram has passed into history! Com. NMS is no more. Yes, from this 26th December, 2017 he is no more with us. He has passed into history; he has become a proud part of it. It is difficult to pen a few lines on NMS when it does call for million such. As for me, it is all the more difficult to write about him without emotional overload. I have been with him in the movement through struggles and campaign, and through personal interactions. Having been in close personal association with him for about half-a-century – 47 years to be exact from October 2017 when I met Com. Saroj and Com. NMS for the first time in my life. I had the privilege of being their personal attendant during their stay in the Government Tourist Home at Madurai. I stayed with them for 2 days. I could hardly control my emotions - the tears rolling down my cheeks - whle penning these few words. However, I would make an honest attempt. Com. NMS will ever be remembered by the insurance employees for whatever he had done for them during his stewardship in many capacities within the AIIEA. 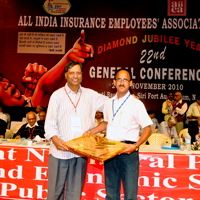 He led the insurance employees into a social movement inculcating in them a culture of concern for others – a social sense much beyond matters mundane. He would take take up issues of creature comforts of the insurance employees but would not stop at that as the end of it all. He would never acquiesce to AIIEA being dubbed as nothing beyond a “bread and butter’ organisation – as often quoted by NMS himself. He would always say, “Charity no doubt begins at home; in no case it should end at home.” This has been his continuous refrain on every conceivable occasion. Overriding all other contributions, two things – the massive campaign and struggle against privatisation of the insurance industry, and the fight for pension – stand out and take a shine to Com. NMS. 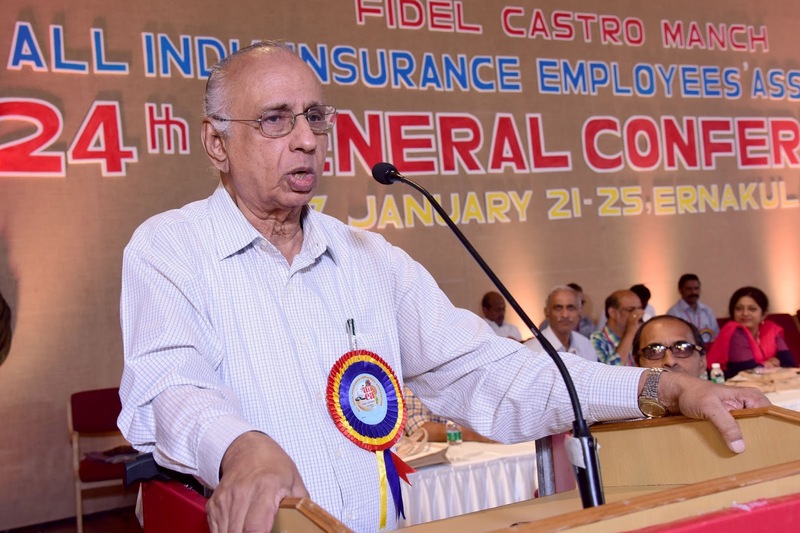 The insurance industry – especially LIC is a hundred percent state owned public sector organisation despite a quarter-century rolling by since the Malhotra panel recommendations for the 50% sell off of the LIC and GIC. Attempts are now being made to tinker with the character of the public sector General insurance corporations; similar attempts may be made against LIC too in the future. AIIEA no doubt continues its fight against privatisation following in the steps of Com. NMS who projected the issue of privatisation as an assault on the Indian economy and the people of India. National public opinion was created precisely based on this understanding by the insurance employees under the tutelage of Com. NMS. And it is the heat and pressure of this public opinion on the powers that be that has kept us in good stead till date. The achievement of Pension is yet another signal contribution of Com. NMS that makes the insurance employees remember him for ever with due gratitude. His succesful interaction with the officials of the finance ministry led to the inclusion of a clause in the pension scheme of the insurance employees. It is a unique feature not available to any funded pension scheme. It enjoins upon the managements to compensate for the additional cost of pension payments - over and above the contributions of the employees - from out of their revenue account. On every issue he mooted, he – of course along with the rest of the leadership - took the entire organisation collectively with him. Not only did he provide the logic to the demands but also the logistics for their implementation. Everyone knows about the fund of knowledge, wisdom and rich experience in his possession. Much has been said about him on this score on many occasions by many, and I would not dilate upon it further. But his greatness lies not only in his ability to teach but in his readiness to learn from others unhesitataingly as well. The accompanying humility he evinced on such occasions was quite brilliant. And it is these and other sterling qualities of Com. NMS that made him a leader par excellence.